Dissecting the interplay between cell membrane signalling, membrane mechanics and cytoskeletal dynamics. The cell surface is a complex platform for signalling, the intake of nutrients, and the sensing of the extracellular environment. The molecular organisation and mechanics of the cell membrane influence these properties. How membrane organisation is in turn influenced by mechanical cues, remains unclear and controversial (Diz-Muñoz, Fletcher and Weiner, 2013; Anishkin et al., 2014; Köster and Mayor, 2016; Sezgin et al., 2017). Using the paradigm of the cell-cell adherens junction (AJ) I will investigate the mechano-sensing and feed-back regulation of membrane tension and cell cortex activity, the interplay between membrane mechanics and membrane organization and the influence of membrane tension on membrane organisation (including the liquid phase separation of membrane proteins and lipids). To study this systematically, I work both in vitro using reconstituted membrane systems and with live cells using custom-built microscopes combined with PDMS based stretcher devices, patterned substrates, micropipette aspiration or optical tweezers. The mechanism of cell division is conserved in many eukaryotes, ranging from yeast to man. A contractile ring of filamentous actin and myosin II motors generates the force to bisect a mother cell into two daughters. The cytokinetic actomyosin ring is among the most complex cellular machines, comprising over 150 proteins. Understanding how these proteins organize themselves into a functional ring with appropriate contractile properties remains one of the great challenges in cell biology. Using supported lipid bilayers as a two-dimensional fluid scaffold and total internal reflection fluorescence microscopy, we test and characterize the function of isolated, actin binding proteins and protein complexes involved in cytokinetic ring formation. For my post doctoral research, I focused on the role of actin and myosin in membrane organization. I pursued this in the laboratory of Dr. Satyajit Mayor at the National Centre for Biological Sciences (NCBS), Bangalore (India). Intrigued by findings in his laboratory and theoretical work by Dr. Madan Rao (NCBS) on actin based processes that drive the clustering of GPI (glycosylphosphatidylinositol) anchored proteins at the plasma membrane of cells, I decided to set up an in vitro minimal actin cortex interacting with a model membrane. Using this novel in vitro system I could show that the distribution and dynamics of membrane particles can be altered by interaction with a myosin-driven, constantly remodeling F-actin network. 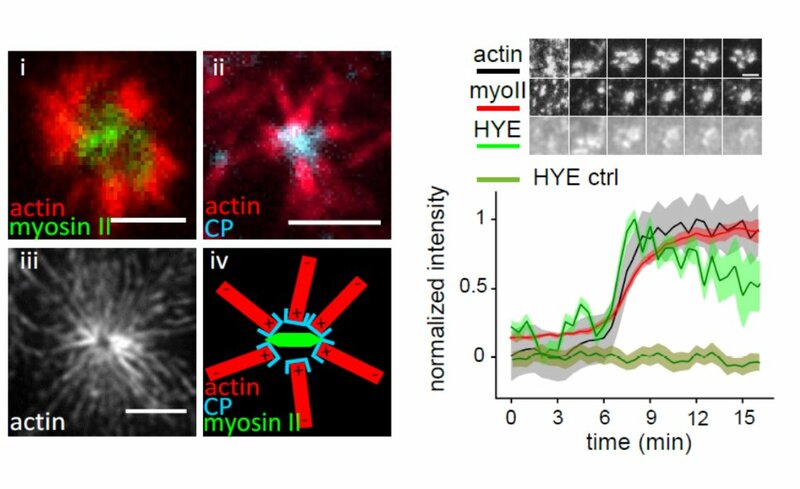 Of special interest was the identification of conditions where the myosin-driven formation of actin asters causes the transient accumulation of membrane particles. This work introduced a new principle of how the organisation of plasma membrane proteins and lipids can be governed by the dynamics of a constantly remodeling actin cortex. It was published in the Proceeding of the National Academy of Sciences (Köster et al., PNAS, 2016) and recommended by Faculty of 1000. This work served as a bridge between the theoretical model of actin dynamics and membrane organization developed by Madan Rao and his coworkers and their experimental cell biological counterparts gathered in the laboratory of Satyajit Mayor and opened a new approach to unravel further questions regarding active processes that control membrane organisation in live cells. A mechanisms to protect cell membranes from sudden mechanical stresses. My PhD at the Institut Curie (Paris, France) investigated the role of caveolae for the mechanical properties of the cell plasma membrane and its reactions to different kinds of mechanical stresses. Though caveolae, which are specialized invaginations of the plasma membrane, were discovered in the 1940s, their role in membrane biology was debatable. 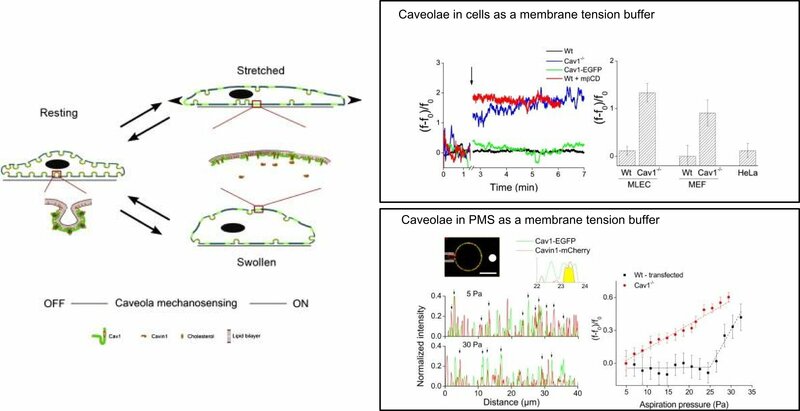 My work demonstrated that caveolae are important for maintaining the integrity of the plasma membrane and act as a membrane tension buffer upon sudden mechanical stresses. This work changed the view of the role of caveolae in cell membranes, was published in Cell (Sinha, Köster et al., Cell, 2011) and was recommended by Faculty of 1000. This project was supervised by Dr. Pierre Nassoy and was a close collaboration between the groups of Dr. Patricia Bassereau and Dr. Ludger Johannes/Dr. Christophe Lamaze. It combined various biophysical techniques with cell biology strategies. Optical tweezers were used to extract membrane tethers from adherent cells at different osmotic conditions, since the force required would be directly proportional to the effective cell membrane tension. For this, I adapted our optical tweezers setup to work with adherent cells and implemented a system to change the osmotic pressure while holding a membrane tether with the tweezers. Together with my colleague Bidisha Sinha, we also designed a PDMS based cell stretcher device which aids the study of single cells under a uni-axial stretch with TIRF microscopy. This device allowed us to confirm the disappearance of single caveolae under defined stress levels. Thirdly, I studied plasma membrane spheres (PMS) obtained from cells expressing labeled caveola markers. Controlling the PMS membrane tension with a micropipette while measuring the force to pull a membrane tube with optical tweezers and observing the presence of functional caveolae with a confocal microscope, I could confirm the proposed role of caveolae in plasma membranes. Based on these findings, I collaborated with Dr. Gillian Butler-Brown at the Institut de Myologie - Hopital Pitie-Salpetriere (Paris), an expert in muscular dystrophy. Muscular dystrophy is a severe debilitating disease, several forms of which are linked to mutations in the caveolin gene. This collaboration allowed me to obtain muscle cells from patients showing a gamut of phenotypes. After establishing a protocol to probe differentiated myotubes with optical tweezers, I was able to show that myotubes with a defect in caveolin show increased levels of membrane tension and have higher probabilities of rupturing under hypo-osmotic shocks, as compared to wild type myotubes (Sinha et al, Cell, 2011; DeWulf et al, biorxiv, 2018). Bodystorm hits Bangalore: Combining Dance and Science to Generate new Ideas. I worked very closely with the dance company Black Label Movement to introduce the concept of Bodystorming to the Indian dance and science community and to start a dialogue between scientists, artists and the broader public. EMBO Lecture Course on Experimental and Theoretical Approaches to Cell Mechanics. ICTS program 2015: MECHANICAL MANIPULATIONS AND RESPONSES AT THE SCALE OF THE CELL AND BEYOND. ICTS program 2013: MECHANICAL MANIPULATIONS AND RESPONSES AT THE SCALE OF THE CELL AND BEYOND. We are very grateful for the generous support from the following sources. India Alliance, DBT - Wellcome Trust | The Bodystorm project with Black Label Movement was supported by an outreach grant of India Alliance - a partnership of the Department of Biotechnology (Govt. of India) and Wellcome Trust.